In August 2013, as China’s leadership sought to reassert control over social media in the midst of the high-profile trial of former Chongqing Party boss Bo Xilai, and ahead of an important leadership conclave expected in October, it renewed pressure on celebrity Weibo accounts with large followings — the so-called “Big V’s” (大V). In an editorial on August 11, China’s official Xinhua News Agency argued that “as recognisable figures in the online world, ‘Big V’s’ must have a stronger sense of social responsibility than ordinary users.” On August 23, angel investor Xue Manzi (薛蛮子), one of China’s most visible “Big V” Weibo users, was reportedly taken away by police on charges of soliciting prostitution. Some commentators viewed Xue’s detention as a deliberate move by authorities to send a caution to influential social media users. 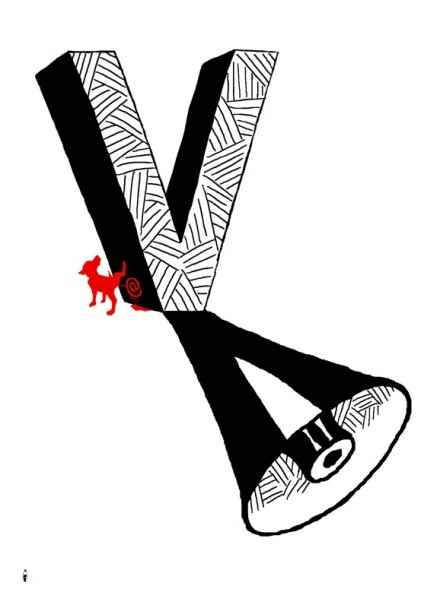 In the above cartoon, posted to Sina Weibo by artist “Black White and Red Xiao Wei” (黑白红小卫32), a “Big V” Weibo account casts a huge shadow shaped like a megaphone, a reflection of its massive power to shape opinion. Meanwhile, small red dog (the Chinese government) wanders by and pees on the V. “That’ll make him stink!” the caption reads. PreviousWhat would you tell your daughter, Mr. Xi? NextAre rumors really so bad?